Quartex clock with short brass hands. This kit includes a Quartex quartz clock movement, short brass hands, a steel hanger, nuts and washers, plus free instructions. The parts you need to make a clock run! 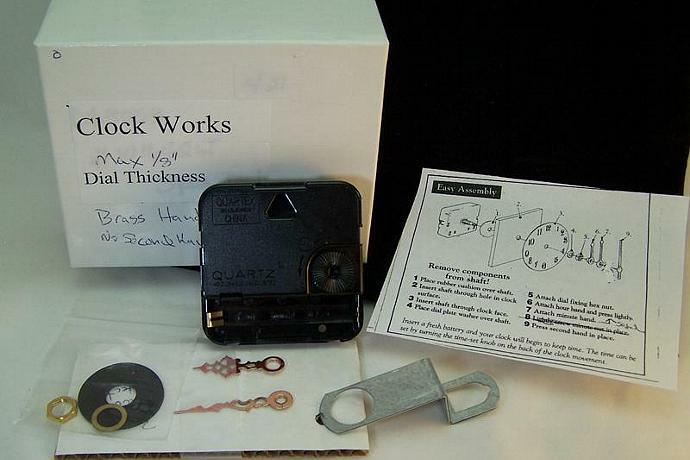 This black plastic Quartex quartz clock movement uses 1 AA battery (not included). The shaft is 11/16" long, for a dial with a maximum thickness of 1/8". The case is 2 3/16" (56mm) square, and 5/8" (16mm) thick. It has a recessed notch that can be used to hang a smaller clock. Fancy short brass hands, they are covered with protective plastic in these pictures. They are bright, polished brass hands. There is no second hand. The minute hand is 1 1/2" long, and the hour hand is 1 1/4" long. The minute hand for this movement pushes on, it does not use a minute hand nut. Brass washers and nut set. This includes 1 black rubber washer, 1 brass dial washer, and 1 dial fixing hex nut. Steel heavy duty hanger, and free general assembly instructions. This kit comes in a small recycled box. I use to make clocks and keep the parts boxed in sets.